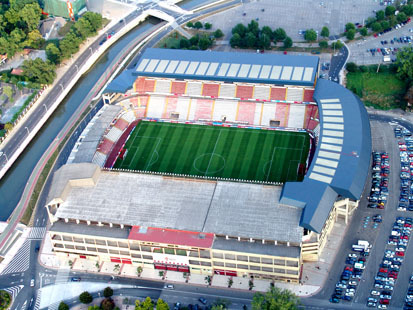 El Molinon is the oldest stadium in all of La Liga and it is also the oldest stadium in all of Spain’s competitive football ground sporting venues. It is the home to Sporting Gijon and the grounds opened in 1908. Last season Sporting celebrated the one hundred year anniversary of the stadium by their promotion back to the top tier. Now over one hundred years in existence, Sporting Gijon hopes to keep El Molinon legendary stadium in good condition for many more decades. At 26,000 capacity, El Molinon is among the league average in stadium capacity. The stadiums most authentic features are the rooftop that covers most of the stands and the red and white striped seats that can clearly be seen from this aerial view. El Molinon is a famous grounds with a lot of rich history. Many of the 1982 World Cup matches were played in El Molinon. Actually a match considered one of the most controversial in football history was played in El Molinon. In 1982 Germany, Austria, and Algeria all played in the same initial group bracket. In one shocking World Cup match held in El Molinon, Algeria upset Germany 2-1. But the real surprise would come a few days later in El Molinon when Germany faced up against Austria. Still today the Germany-Austria match played in El Molinon has repercussions on the way the World Cup is set up. The fiasco was this. Austria already was secure for a birth to the next round. Almeria and Germany were both on the bubble, but if Germany did not win their match then Almeria would advance. Many football critics believe that Austria threw the match 1-0 to Germany by allowing an uncontested goal. Both teams advanced to the next round and Almeria was left out in the cold.Because of this terrible incident both final World Cup matches are now played at the same time.